Lug Rigs for large and small sailboats. Sailors have been using Lug Rigs for centuries because of their unique sailing abilities. The lug combines the efficiency of a square sail, when running before the wind with the windward ability of a fore and aft rig. 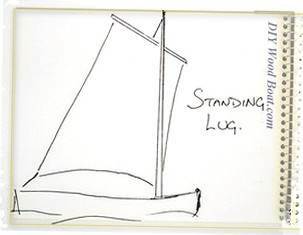 Like a square sail, the lug’s sail is suspended from a gaff. 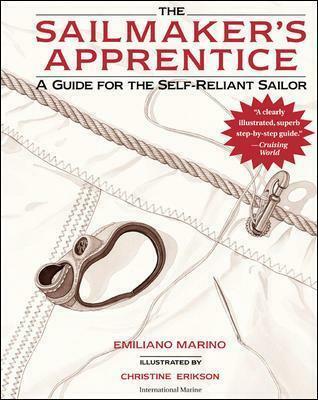 However, unlike the square sail the halyard is not attached to the center of the gaff but closer to the leading edge. 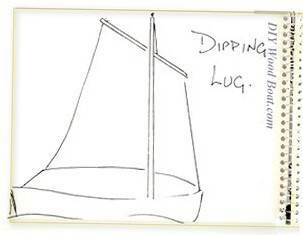 There are four basic types of lug sail. The gaff sail and sprit sail are also four cornered rigs but their sail hangs completely behind the mast. This does mean that the mast doesn’t interfere with the sail making it cleaner. However, this does put the center of effort well behind the mast which requires more staying to hold the mast upright and makes it more difficult to control twist in the sail. 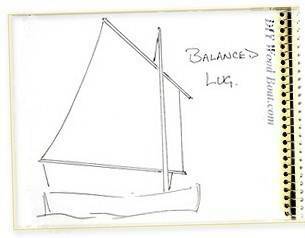 Too much twist will mean that while the bottom of the sail is drawing the top will stall. Too much twist can also mean that the sail will tend to drive downwards, increasing the healing moment. Lug rigs, with their center of effort further forward overcome these problems. The dipping lug is so called because each time the boat tacks or gibes the whole sail and gaff must be brought around to the leeward side of the mast. This prevents the mast spoiling the shape of the sail if it where to be left on the leeward side. The problem with using this sail is the coordination needed to quickly dip the sail when tacking. For this reason it is generally used on boats which are likely to travel long distances on one tack. It is also why most recreational craft use standing or balance lugs. With the standing lug, the yard and sail usually remain on one side of the mast. In the west, lug rigs traditionally mount the sail on the port side, which probably accounts for the rule for giving way to boats on starboard tack. However, it can be fitted with a tripping line from the throat which allows the gaff to be dipped. The tack of this rig is set close to the mast. Like the dipping lug it is usually loose footed. The balanced lug is similar to the standing lug, except that it has a boom. And the boom extends beyond the mast, the tack being affixed back from its leading edge. This allows more of the sail’s leading edge to extend in front of the mast. This means that the sail is more balanced, hence the name. This is an ideal rig for small boats with short masts as the sail can be peaked up high and needs a minimum of rigging. 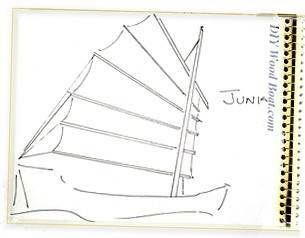 The Junk has been in use in a myriad of styles and on boats of all sizes for centuries in East Asia. The Chinese navy circumnavigated the globe, in their Junks in the fifteenth century while European sailors were still coming to terms with the idea that the world was spherical. More on how to rig a junk sail.